A dental implant is required when you have a tooth extracted that leaves a gap in your mouth, this gap will eventually close. The hole where the tooth root is will eventually collapse as there’s nothing to support the bone around it. The space between the teeth may be closed when teeth either side of the gap move over inside. These will affect your ability to chew and eat correctly and in the future can cause more damage to other healthy teeth. Dental implants bring back the look, feel and function of your tooth and can go from single tooth restoration to a full mouth restoration. It can be used a single crown to make the implant a replacement for a single tooth. Even a full upper or lower denture can be supported on four implants per arch to restore every missing tooth. A dental implant is a titanium screw that gets implanted into the jaw where the tooth’s root used to be, and becomes an artificial root. The titanium it’s bio-compatible whereby the tissue will form around the metal without inflammation or rejection of the implant. The first step is to remove the tooth or teeth that need to be replaced, if they haven’t been taken out yet. After that, the implant is placed into the jaw. Once the gum is sewed over the top, the area is ready to heal and the bone eventually will fuse to the implant. 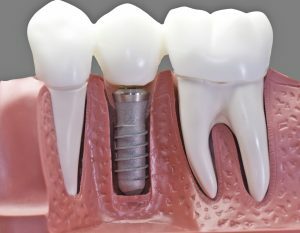 When the implant is set in place, the gum will be opened and a connecting point or abutment will be attached to the implant. At the end, the restoration is connected to the abutment. This process can take several weeks to months; it will depend on the number of implants, health of the mouth, and available bone volume. Implants are convenient for almost everyone with a healthy mouth and enough bone volume. Too little bone volume. This can be repair with bone augmentation or grafting in certain cases. Smoking is never good for any major oral surgery, as it increases the risk of gum disease and weakens the gums.